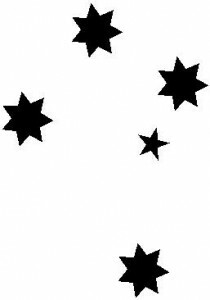 The Southern Cross, the smallest of the 88 recognised constellations, has guided navigators for centuries and its familiar shape can be used as a compass and a clock. To navigate and tell the time by the Southern Cross, find the four stars that make up the cross shape. If you don’t see it at first, follow the two pointer stars, Alpha and Beta Centauri, that always aim towards the head of the Cross. Alpha Centauri is the closest star to our Sun, while Beta is very bright and easy to find. The longest axis of the cross always points towards the South Celestial Pole, the point in the sky around which all the stars seen from the Southern Hemisphere rotate. To find the pole, mentally extend the Cross’s axis by 3.5 times its length. Or you can extend the axis out to Achernar, the next bright star, and cut that distance in half. “Once you find the South Celestial Pole, all you have to do is mentally drop a line,” Lomb says. “Where that point hits the horizon, that’s the direction of south.” Because the Southern Cross rotates clockwise around the Celestial South Pole once every day, you can also tell the time by its position in the sky. Face the south and look up at the South Celestial Pole. Imagine the sky as a big 24-hour clock with the pole at the centre. The clock should have 2400/midnight at the top; 0600/6am at right; 1200/noon at the bottom; and 1800/6pm at left. The longest axis of the Cross moves like the short hand around the clock – but there’s a catch. If the date is April 1, the Cross’s position will indicate the exact hour. For other months, you need an extra calculation. Count how many months have passed since April and multiply by two. Then “wind back the clock” by that number of hours. So, at midnight on April 1, the Southern Cross will be at the 2400/midnight position. At midnight on May 1, the Cross will be in the 0200/2am position. At midnight tonight (above), the Cross will be near the 1600/4pm position because it’s been almost eight months since April 1 – that’s 1600/4pm minus (2 x 8 months) = 1200/midnight. Or you could buy a watch.